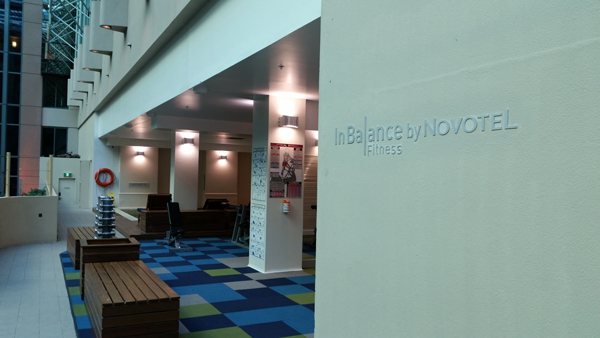 When you think of premier accommodation options, you can't go past the Novotel chain. With hotels in every major city, you're likely to find one to meet your accommodation needs. The city of Melbourne is lucky enough to have several within their suburbs, but the most central one for visitors to the city is the one located on Collins Street in the heart of the CBD. 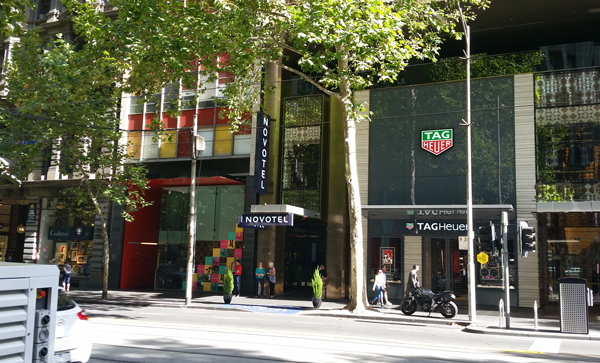 Novotel Melbourne on Collins, located at 270 Collins Street, can be found directly above the fashionable St. Collins Lane, a unique shopping destination which houses many high-end retailers and boutiques. 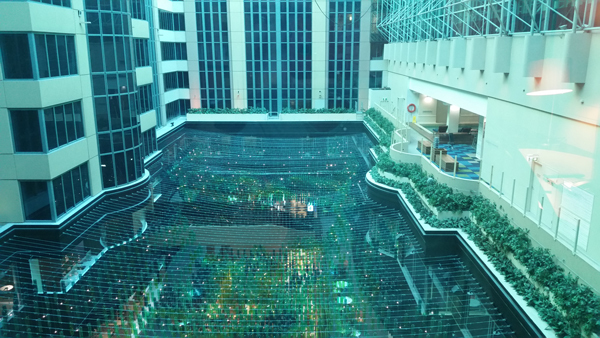 The reception area on the third floor looks down onto the top of the intricately decorated levels of the shopping complex, while the unassumingly narrow entrance on street level doesn't even begin to hint at how large the hotel is behind the Collins Street facade. Also featuring a large dining area, bar, gym and pool, this hotel is perfect for the guest looking for a little opulence during their stay. 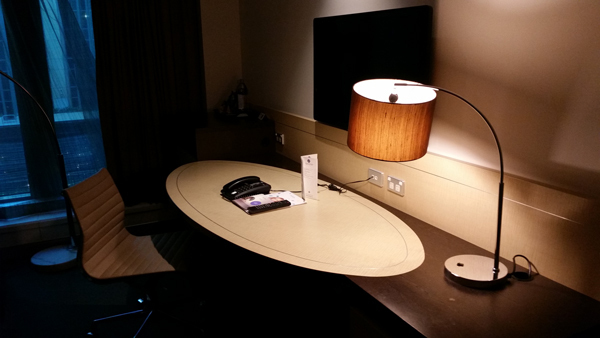 The rooms are large and tastefully decorated with a modern decor and an urban feel. 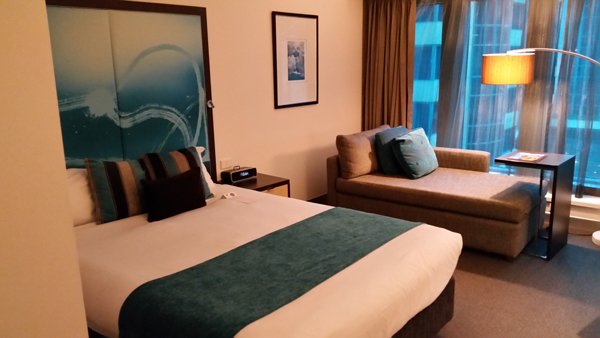 Featuring a blonde and dark wood colour theme, set off by splashes of blue, turquoise, dark brown and grey, the standard rooms feature a queen bed and look out onto either the shopping centre atrium or the city. On entering the room, you will see the queen-size bed, and slightly beyond, a comfortable tan- coloured daybed where you can lounge and read, or simply look out the window at the unique view of the inner hotel and shopping complex spaces. For those who would prefer a more professional sitting area in order to do business, there is a large wooden desk which covers a decent length of the room and houses internet and communication cables. Hidden under the window-end of the desk is a mini bar-fridge, with your usual assortment of snacks and drinks (alcoholic and non-alcoholic) if you choose to spend a little extra and make use of their availability. The room also contains the usual tea and instant coffee amenities if you would prefer to make yourself a warm beverage at no added cost, although with the amount of fantastic coffee bars and cafes that can be found in Melbourne, you'd be better off going out and getting something barista-made. A doorway by the entrance of the room leads into a modern-look bathroom, with an open glass-screen shower and rounded rectangular basin. Following the blonde and dark brown colour theme of the furniture, this too is of a complementary colour and adds to the sophisticated look overall. Fairtrade shampoo, conditioner and shower gels, along with the hotel's Planet 21 mission on guests reusing towels for sustainability, further add to the ethical appeal of the Novotel chain. 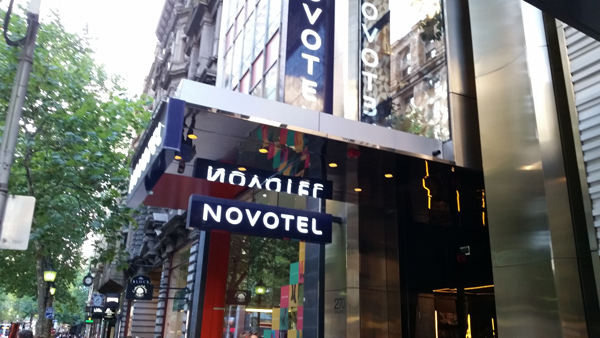 This is a fantastic hotel if you are looking for that little bit extra while staying in Melbourne's CBD. 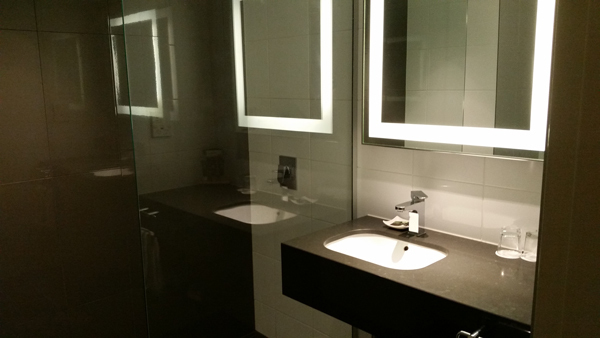 The rooms have everything you need, the staff are friendly and helpful and you will find yourself in close proximity to most of Melbourne's main attractions.